After a 1 year hiatus, the much anticipated 28th edition of the Make A Wish Tuna Challenge returned much to the delight of anglers, volunteers and the community alike. Over 200 anglers, which included 13 ladies and 9 juniors fished on 45 boats setting a number of tuna challenge records. In the 27 year history of the tuna challenge, two tuna over 200-pounds had been caught, both in 2016. 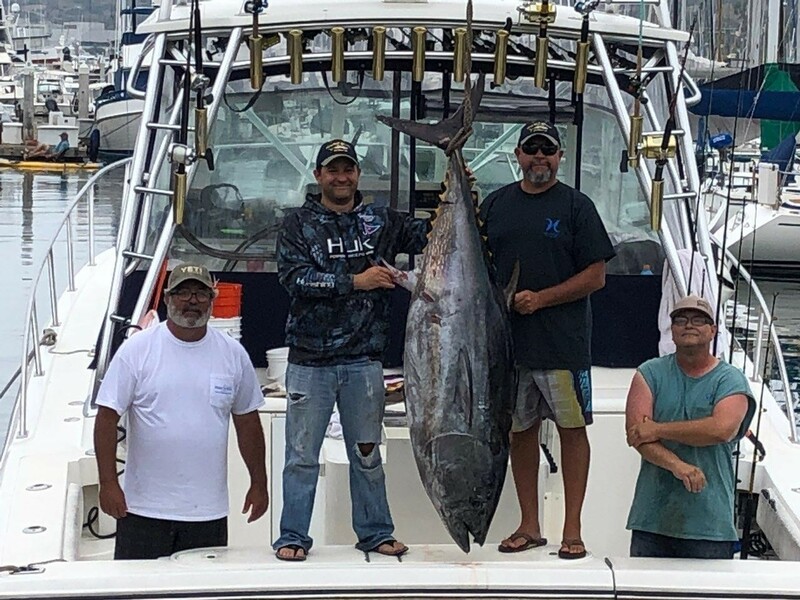 While Tony Dileva’s 259.0 record bluefin remained safe, a total of 8 cow bluefin hit the decks for tuna challenge anglers with another 3 between 150-170-pounds landed as well. Anglers deciding to fish for quantity over quality went South catching schoolie yellowfin, skipjack and dorado. Although both the weather and the Navy’s patrolling of San Clemente Island posed a logistical threat, several of the larger boats went West going for broke. A combination of the yummie flyers, flat falls, dead flyers on the balloon/kite rig and live mackerel did the trick for those that scored. Standing to the left of the tuna in the photo is Michael Mooradian on the “Get Knotty” with his 226.6-pound tournament winning bluefin. The Richard Thomas Memorial top overall angler was Michael Mooradian fishing on the “Get Knotty” with a 226.6-pound slug bluefin. Thomas’ fish earned him a 4 day/3 night Alaska fishing adventure courtesy of Big Blue Charters in Sitka. Teammate Miguel Martinez bested a 216.6-pounder earning Miguel 3rd place in the larger boat angler awards and the boat 2nd place overall in the tournament. 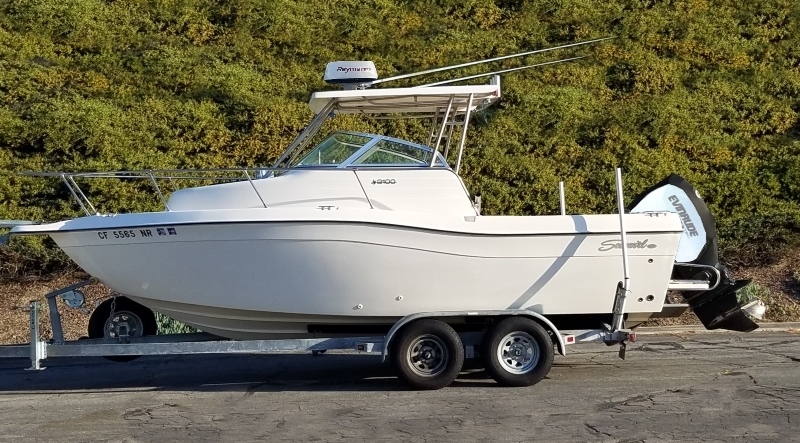 The top overall team was the crew (Dan Brown, Connor Burke, Brian Burke, Gary Burke, Nick DeGeorge, Frank Altamare, and Jeff Stewart) of the “Reel E-Ze” who caught 3 large bluefin capped by Brian’s 224.0-pound beast that took home 1st place in the Larger Boat division. Team Captain Dan Brown reported not having a bite until 4:00 PM and then went 3 for 6 on the big brutes fishing the kite. 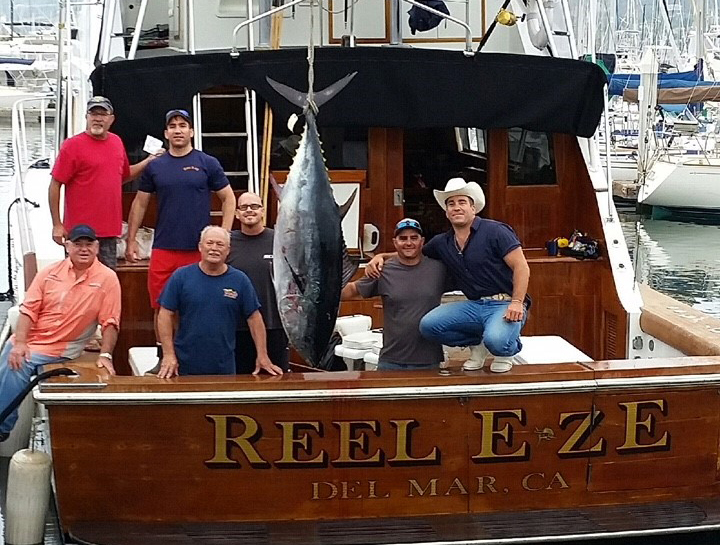 The “Reel E-Ze” shattered the previous team Tuna Challenge record with their 595.8 point total. 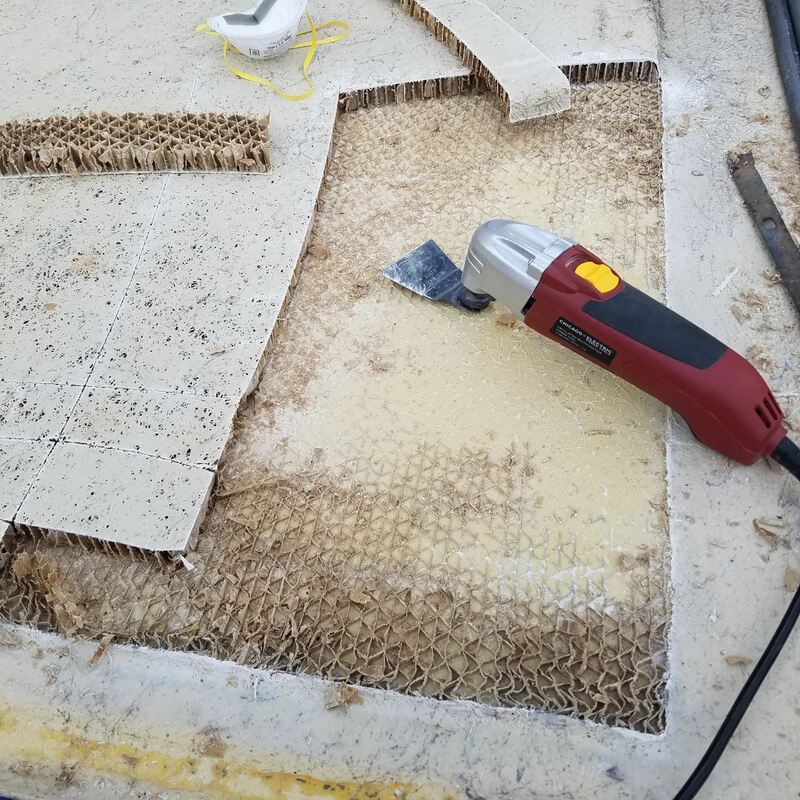 The previous team record of 377.8 points was set by the “Esperanza” in 2016 and was eclipsed this year by the top four boats. The “Cabrilla” with a 213.6-pound shortfin and “Sauerfish” with a 221.0-pound blue both broke the previous team record and rounded out 3rd place overall for the tournament in a flat out tie. 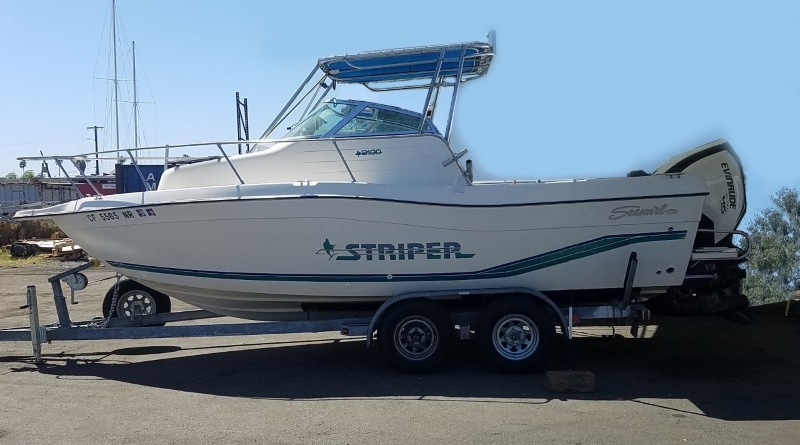 The Smaller Boat Division was taken by the team of the “Reel Hard” with a total of 48.60 points edging out the “Shermanator” and the “Reel Medicine” for the division title and the coveted championship jackets. The “Reel Hard” fished South with the fleet earning the title with a mix of yellowfin and skipjack tuna. In the Junior’s division, Nick Genovese captured the title for the 2nd Make A Wish tournament in a row with a 14.8-pound yellowfin about the “Reel Medicine.” Lucas Carlson finished 2nd in the 12-15 y/o division with a 8.6-pound skipjack tuna. 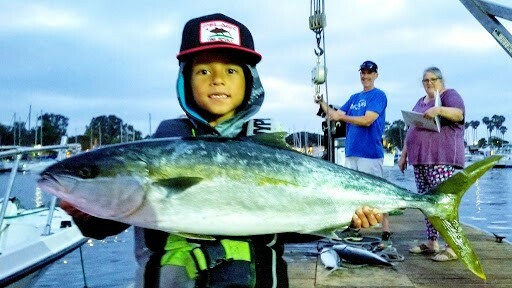 Alexander Angeles with his 13.6 lb yellowtail that captured the 11 and under Juniors division and largest yellowtail award. The High Lady Angler award sponsored by Izorline International was taken by Irene Griqonudis on the “Seacall” with a 14-pound yellowfin. 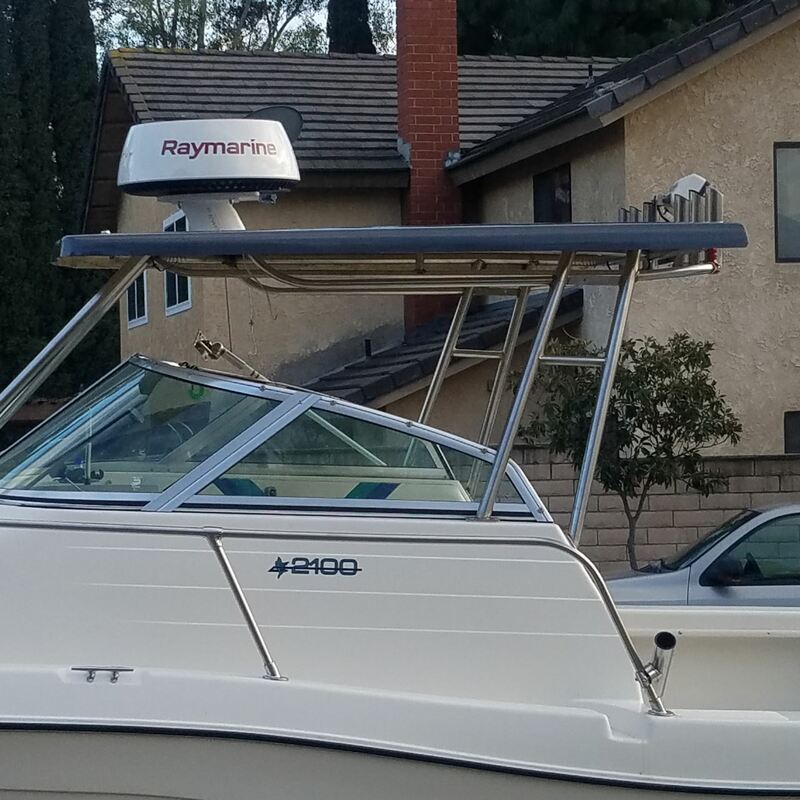 Lastly, the Top Club Award was brought home by Southwestern Yacht Club Anglers with a landslide 846.80 point victory for their top 3 boats. The biggest winner of the tournament as usual was the Make A Wish Foundation of San Diego. The Make A Wish Tuna Challenge committee, host UPSES Portuguese Hall, volunteers, sponsors and generous anglers are pleased to announce that a total of $120,000+ was raised towards granting wishes to children with life threatening illnesses. Special accolades go out to 4 time chairman Mike Smith for resurrecting the Tuna Challenge under his leadership. Congratulations to all for their hard work and dedication!